So yeah, first, let's go to body products. 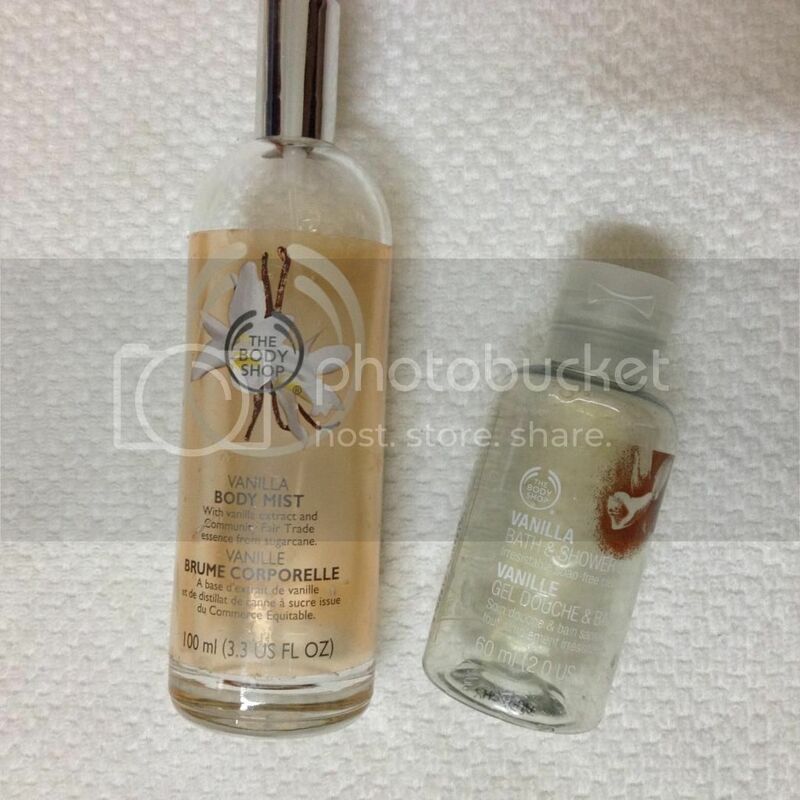 Finally, after almost 11 months, I finished my White Musk fragrances from The Body Shop. I've been repurchasing these more times than I can remember but as you may already know, based on July's haul, I got myself new set of fragrances so I guess after a long time it's gonna take some time before I'm rolling back to these. Next, Blackberry & Black Tea Shower Cream and Body Polish from Watsons. I gotta say, I don't really like these two. As for the showering cream, the pump doesn't work properly as I have to pump like 10 times to get the product out. Not pretty. The shower cream is nice but I don't really like the scent. The body polish is even worst. I'm sorry but it doesn't help me with dead skin cells at all. So not gonna repurchase them. That Lavender Shower gel, 1000ml for only around RM7 (USD2) as I bought it during sale, love it! Not only affordable, it smells nice and it's gel-type so yeah. Texture is light and not too bubbly compared to the two on the left photo. For hair, I used these Sunsilk Co-Creations Lively Clean and Fresh Shampoo and Conditioner for the past few months and though I'd put trust in these and repurchase the shampoo twice, still didn't work well with me. Gives me dry scalp. Again, not pretty. So I decided to go back to Head & Shoulder and not gonna repurchase these. More than a month ago, I went back to hometown for Eid for about 2 weeks so I used up the Laneige White Plus Renew Trial Kit and that Original Essence 10ml sample from the same line. It's so nice as I don't even have to transfer the products from the full-sized bottles into traveling containers. One kit lasts for about 2 weeks so yeah. Awesome. Next is this Real Nature Strawberry Sherbet Mask Pack from TheFaceShop. I think I'm gonna stick with what I said in my review, it's just an average mask pack. I don't think I'll be repurchasing this again. For cleansing, first, I used up the Every Month Cleansing Foam #2 Pomegranate & Berry (Firming) from Etude House within a month in August I think.This one is not only cute but works nice as well. When I'm done going through all the cleansers from the same line I think I'm gonna roll back to this one so yes, will repurchase! Second, I used up the Wonder Pore Whipping Foaming also from Etude House. A great cleanser! I sometimes just use this on its own for both removing makeup and as foam cleanser in the evening. Well, it removes pretty much my BB Creams but not my waterproof Laneige BB Cushion. But still, definitely gonna repurchase it. Thirdly, I recently finished this Milky You One-Step Cleansing Foam also from Etude House. In the review I mentioned that I love this cleanser and that impression lasts till I finished this up. I will be repurchasing this if there's a sale (cause its retail price is over RM50!!) or maybe I should grab other items from the same line along with this one as I haven't tried the cleansing milk and the cleansing foam (yes, there're two type cleansing foam in this line). Next is the Magic Bubble: Creamy Peeling Wash (left) and the Magic Bubble: O2 Water Peeling Pack (right) both from Etude House. I bought the left one October last year and the right one in January I think. As for the Creamy Peeling Wash, I honestly kinda disappointed as whether the pump isn't working or if it's really finished, I can't tell cause no matter how hard I pumped the nozzle and shook the can, not much of product comes out. But every time I shook the can I can tell that there's product left. I don't know but I hope there's not so much of it! Still, as I opened it last year around October, it's time to throw it out. As for the Oxygen Water Peeling Pack, I love it! I think I'm going to repurchase if Etude House is on sale again but for the other one, definitely NO. Next is Natural Sun AQ Super White Sun Cream SPF50 PA+++ (Whitening) from TheFaceShop. This is my first sunscreen ever in my life! haha But unfortunately, after about 10 months of using it (more than three quarters I can tell) whenever I use it my face get a little oily and I don't like that at all. So yeah, though I didn't finished it, I have to throw it out. As you probably know, this product has been discontinued and replaced by the new Natural Sun Eco line. I bought some items from that line and just started using them so I'll let you guys know about it soon. BTW, to new followers of this blog, I'd like to welcome you to my humble place where I just sincerely wanna share with you guys about stuffs I love and care about. This month remarks the first anniversary of my blog and I gotta say I wouldn't come this far if it wasn't because of your support! So thank you so much to all my lovelies! I'm planning to... hehehe surprise! I'll let you know when I'm ready for it and announce it in my Facebook page! So to you out there who haven't followed my Facebook page please do show your support as there will be a special treat for you! P.S. : Wanna check out my previous Empties posts?